It's finally that time. The time we've been waiting for. It's exciting, yet simultaneously terrifying. The possibility of conceiving another child is clearly exciting, yet the possibility of losing another child is terrifying. Before the loss, we knew a miscarriage was a possible. We were fearful it would happen to us, but it still felt an arm's length away or at least another person's experience away. However, this time everything is different. It's not just possible. It doesn't just happen. It happened to us. It is real. It's difficult to explain how different it feels this time. We have faced a reality that suggests there is a chance we will never see our hopes and dreams come to life. We know firsthand that everything does not happen as easily or perfectly as what some of us are told. The innocence has been lost. We do not face this time with the same pure excitement and anticipation of our hopes and dreams literally coming to life. Instead, it is now threaded with tremendous fear and anxiety. Fear of the unknown. Will we be able to get pregnant again? Will we be able to conceive in the same time frame as before? Is my body able to carry a child to full-term? Will our child be healthy? Will we loose another child and go through this all over again? Yet, even when all our fear and anxiety is staring us in the face, we press onward. We choose to try again even though it may mean we will loose another child. We choose to open our hearts to another child even if it means we may never hold him or her in our arms on this earth. This is hope and courage even in the midst of the most terrifying fear and paralyzing anxiety. So here's to what is completely and utterly out of our control. We surrender our wants and desires to God once again, yet ferociously hope we will see our hopes and desires come to fruition. We have done all that is within our power and control. The rest is in God's hands. Now, we eagerly await the next couple weeks to see what only time will tell. For the past couple weeks, my husband and I have been attempting to choose a name for our baby, which has been easier said then done. Without knowing the gender or not yet seeing the face of our beautiful baby boy or girl, choosing the right name has been a mysterious process. So in the meantime, I have prayed many prayers that sounded like this: "Jesus, you have spent time with our baby face to face, please provide a name that fits him or her well." I realize that not all parents of miscarried children choose to give their babies a name. There is no right or wrong decision. This is just something we have chosen to do and is meaningful to us. However, to be honest, it didn't start out that way initially. Shortly after we found out that we had lost our baby, I almost immediately wanted to give our baby a name. I longed for a tangible way to acknowledge the short, but significant life of our baby. My husband did not feel this way at that time so I respected his feelings and dropped the topic. This is just one example of how spouses or significant others may differ in the grieving process, and although it may be difficult at the time respecting one another's differences is love in action. About four months after our initial discussion and much prayer and patience, I gently brought up the idea to him again to see if he felt the same as before or if anything had changed. To my surprise, he immediately responded, "Yes, let's do it", thus commencing the beginning of our name hunt. After looking at multiple websites and reading hundreds of names, we narrowed it down to a few gender-neutral names we both liked the sound of. However, we struggled to find a name that rang beautifully in our ears and carried significant meaning so we continued to wrestle with the idea for the next several days. "Ashton" was one of the few names we both liked the sound of and could imagine calling our baby boy or girl. And "Hope", we choose hope because of the hope we have chosen to cling to throughout this entire process. Hope that God will sustain us when it feels like hope is lost. Hope that God will heal our hearts. Hope that God will bring beauty out of this mess. And finally, hope that one day we will see our baby face to face. Thank you, Jesus! Ashton Hope, it feels so good to call you by name. Thank you for the honor and privilege it is to be your mommy. Tonight, I just wanted to write a quick to post to acknowledge all the mommies I witnessed remembering their babies today. 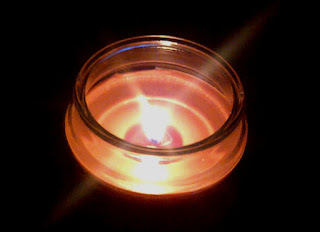 For those of you who don't know, which I am sure most of you do, today is "Pregnancy and Infant Loss Remembrance Day". Today, I have been blessed by the courage and strength of all the women I have witnessed publicly remembering and acknowledging their babies on this special day. Thank you for your authenticity and bravery. You are inspiring. Tonight, our candles are lit in memory of our precious babies who are in the arms of Jesus. We miss you so much, but rest in the hope that we will see you and hold you again, for some, or for the first time, for others. Your lives, although short, have forever changed ours. You are loved. Several weeks ago, I was speaking to my co-worker and she was talking about how we often ask the question "Why?" when we are facing difficult and/or painful circumstances, but rarely ask "Why not?". I was put off by her statement at first especially considering the fact that I have been wrestling with my own "Why?" question, however as I began to consider her perspective with an open heart and mind, I was humbled. I am quick to ask God "Why? ", but have never considered asking "Why not?". When I dare to ask the question "Why not? ", I cannot help but think "Who am I to be exempt from experiencing pain in this far from perfect world?" Yes, not everyone experiences the pain and heartache of a miscarriage, but in this less than perfect world, we all experience pain. Pain, that although it bears different names and circumstances, is a pain that breaks hearts all the same. So "Who am I to think that I should be exempt from this pain while other mothers suffer?" "Who am I am to critique or judge who should or should not face certain circumstances and its associated pain?" Only God has the power and authority over those things, not me. Don't get me wrong, asking the question "Why not?" does not diminish the pain, but it does offer another perspective. Also, it does not mean we still do not need to wrestle with the question "Why", it just means we should not stop there. The reality is that we often do not know "Why? ", but we can rest in the fact that there is One who does and He deeply loves and cares for us. So although I know little, I am choosing to trust that God knows everything, including the answers to my "Why?" and "Why not?" questions. For me, it all keeps coming back to surrender. Surrendering my pride, admitting that I do not know everything. Surrendering my desires, trusting God even if I never get what I want. Surrendering to His plan, even when I do not like it and it does not make any sense to me. Surrendering to His love, trusting that He loves me even when it may not feel that way. "Why not?" It's better than the alternatives.